Introduction Metropolitan PGA Members, Associates, and Friends: Welcome to the 2019 golf season here in New York. The weather is breaking, and we are excited to get outside playing, teaching, and pulling people into this great game. As a foreword to this E-Magazine, we wanted to explain the recent updates to our communication efforts. You’ve probably noticed that we no longer produce a monthly newsletter as we previously had. Instead, we are sending a more concise weekly E-Newsletter, each Monday, to focus on the most pertinent and current news. The philosophy is an obvious reaction to demand for shorter news cycles and immediate information, that we’ve all come to expect in almost everything we do. To supplement this, and because of our great desire to distribute a publication that highlights our association’s successes, we have added this quarterly E-Magazine. This will allow us to report in greater depth, somewhat akin to the former monthly newsletter. Please enjoy this magazine and here’s to a great 2019 golf season! Welcome to the start of the 2019 season! I am excited to work with your Board and the Met PGA Staff to bring our members competitive tournaments on outstanding courses, educational opportunities from top speakers and presenters, employment tools and assistance, fraternal experiences to help network and many opportunities to get involved in any one of the pillars that make up our Met PGA Foundation. With the entire golf world descending on Bethpage in May, we are preparing for hosting a major championship in the Met Section. We plan to provide our PGA Members and Associates with a once in a lifetime experience. The PGA Member Hospitality Club will give you access to discounted food and drinks and a warm place to relax and enjoy the history of the Met PGA. If you attend with family or guests, I can assure you they will be exposed to the expertise our section members have showcased in playing, teaching and growing the game over the past 100 years. Met Section members have had a productive winter with many professionals competing in the PGA Winter Series, while others continued their ongoing education, gaining certifications and improving their coaching skills and playing ability throughout the winter. I believe it is extremely important for our members to continue to learn, adapt and prepare for their futures by attending PGA educational opportunities. In the Met Section, we have many opportunities for our Assistants to learn, grow and be mentored by experienced Head Professionals. We have unique programs geared specifically for Head Professionals who want to stay hungry and continue to learn and improve their skills to prepare for the changing landscape of our business. ASSISTANT SPRING MEETING — Elections will be Conducted! 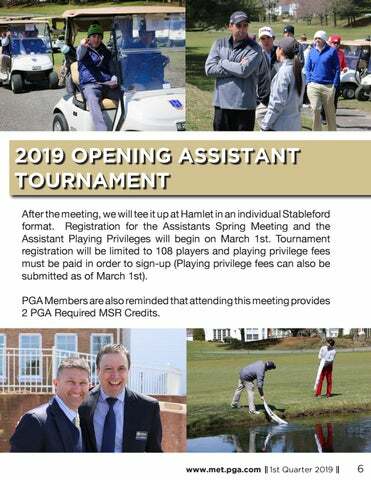 Our opening meeting and tournament for our Assistant Association will take place on Monday, April 15th at The Hamlet G&CC. The annual gathering provides a great opportunity to meet new additions to the Section and share plans for the upcoming season. The meeting will be under the leadership of the Assistant Association Officers, whose positions have been reconfigured to mirror the structure of the Metropolitan PGA’s Board of Directors. The current Assistant Association Officers are: President, Alex Smith (Garden City GC), Secretary, John Schmoll (Burning Tree CC), Treasurer Tyler Lower (Burning Tree CC), and 1st Vice President John DiPilato (Old Oaks CC). Though these officers are elected annually at our Fall Meeting, the vacancy created with the departure of Frankie Martinez has created a need to elect one position (2nd Vice President) at this year’s Spring Meeting. This year, we have added access to the Assistant Spring Meeting as an additional benefit to our Partners and Sponsors. The relationships between Met PGA Professionals and our Partners Program company representatives is extremely critical to all parties. Our Partners are very interested in connecting with Assistant Professionals, and creating rapport with these companies will be a benefit for golf professionals as they advance their careers. 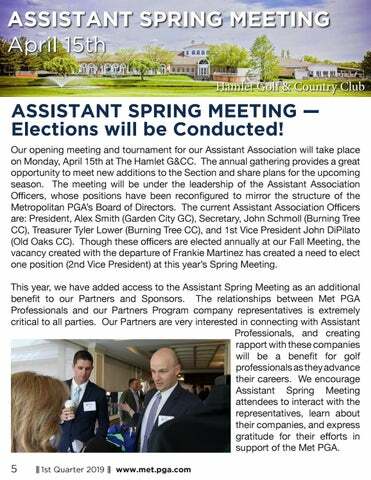 We encourage Assistant Spring Meeting attendees to interact with the representatives, learn about their companies, and express gratitude for their efforts in support of the Met PGA. 2019 OPENING ASSISTANT TOURNAMENT After the meeting, we will tee it up at Hamlet in an individual Stableford format. Registration for the Assistants Spring Meeting and the Assistant Playing Privileges will begin on March 1st. Tournament registration will be limited to 108 players and playing privilege fees must be paid in order to sign-up (Playing privilege fees can also be submitted as of March 1st). PGA Members are also reminded that attending this meeting provides 2 PGA Required MSR Credits. 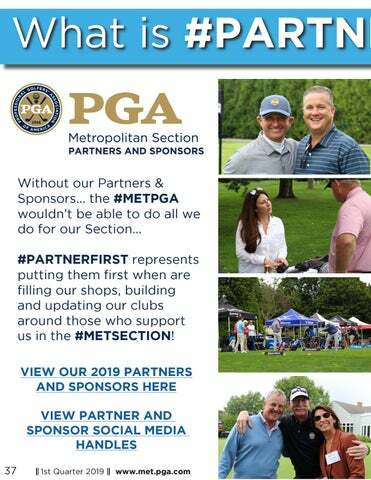 MET PGA SPRING MEETIN April 18th, 2019 | Bethpage State Park The Metropolitan PGA Spring Meeting is our annual opportunity to gather, share ideas, conduct Association business, and announce plans for the upcoming season. 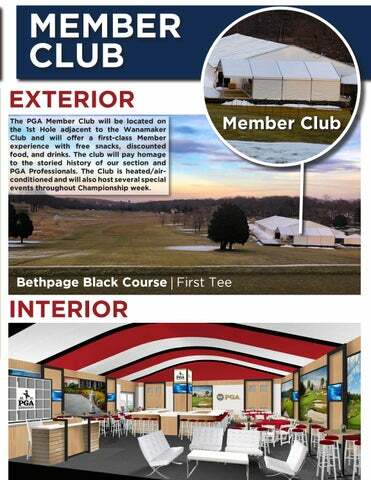 This yearâ&#x20AC;&#x2122;s meeting will be held on Thursday, April 18th at Bethpage State Park, to capture the excitement of the PGA Championship which will be played on the famed Black Course less than a month later. PGA members will hear updates about tournaments, junior golf, national programs, member benefits, and sponsor engagement. Spring Meeting Key Note Speaker Ian James, CEO | Retail Tribe The meeting will also feature Ian James of Retail Tribe, talking about the value of PGA professionals and the importance of them being viewed as the CEO of Golf and Fun at their facilities. RetailTribe develops campaigns and content to help Golf Clubs and PGA Professionals drive additional participation and activity at their facilities, in their shops and in their coaching and training programs. The result: increased revenue, stronger communities and greater loyalty. Reminder that your attendance at the Spring Meeting provides 4 MSR Credits in the required meeting category. 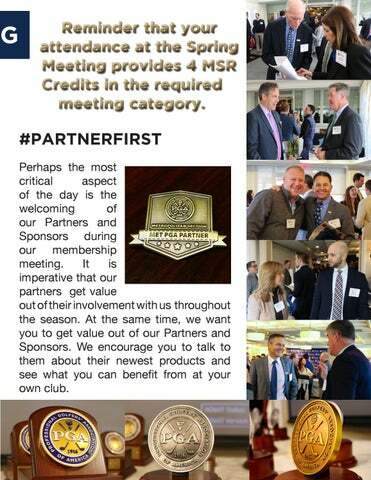 #PARTNERFIRST Perhaps the most critical aspect of the day is the welcoming of our Partners and Sponsors during our membership meeting. 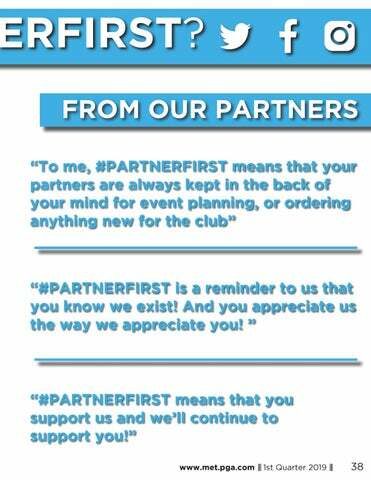 It is imperative that our partners get value out of their involvement with us throughout the season. At the same time, we want you to get value out of our Partners and Sponsors. We encourage you to talk to them about their newest products and see what you can benefit from at your own club. 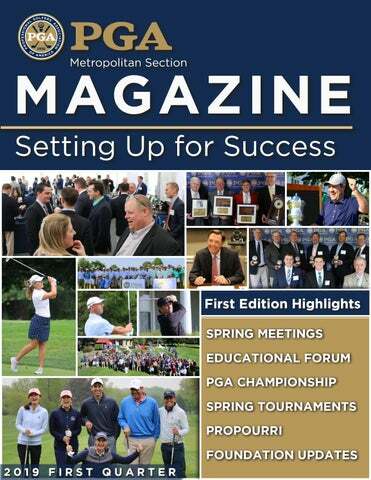 The Spring Educational Forum has always been a marquee event with the greatest minds in the golf industry speaking to the Metropolitan PGA Section. This year is no different where we will be lucky enough to have the Mike Adams, Director of Instruction at Fiddler’s Elbow Country Club and the 2016 PGA of America National Teacher of the Year, as well as Dr. Scott Lynn who is an Associate Professor at California State University, Fullerton and is Research Director at Swing Catalyst. 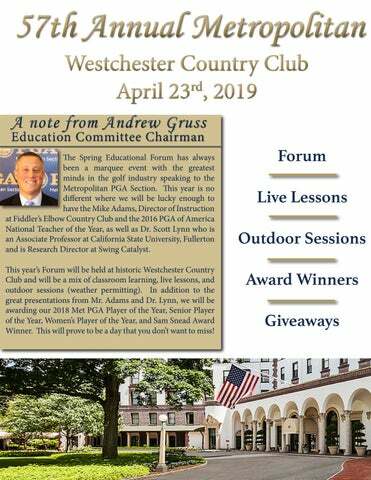 This year’s Forum will be held at historic Westchester Country Club and will be a mix of classroom learning, live lessons, and outdoor sessions (weather permitting). In addition to the great presentations from Mr. Adams and Dr. Lynn, we will be awarding our 2018 Met PGA Player of the Year, Senior Player of the Year, Women’s Player of the Year, and Sam Snead Award Winner. This will prove to be a day that you don’t want to miss! product is the Swing Catalyst video analysis software, praised by golfers and golf coaches around the world. The Swing Catalyst software also integrates and synchronizes data from the Swing Catalyst Balance Plate/3D Motion Plate, up to 4 x high-speed cameras and the most popular ball and club tracking devices on the market. As is our tradition, a portion of the day will be dedicated to honoring our OMEGA Met PGA Players of the Year and also presenting the Sam Snead Award which is among the section’s top honors. This year, Fresh Meadow Country Club’s new head professional, Danny Balin, will collect an OMEGA timepiece signifying his accomplishments as our player of the year for the fourth time. Danny will be joined by Century Country Club’s Frank Bensel as he is recognized as our Senior Player of the Year, and our Woman Player of the Year Jessica Carafiello of Innis Arden Golf Club. Met PGA Partner Adidas Golf will be supporting the Educational Forum and offering a gift of golf shoes for the first 200 PGA professionals who register for the event at Westchester Country Club on Tuesday, April 23rd. Adidas will also use this platform to announce an exciting bonus of $1,000 to the first player to win a Met PGA major championship wearing their product. Director of the WGACSF from 1991-2016. Bob has been on the board of the Westchester Golf Association and the WGA Caddie Scholarship Fund for forty-four years. Similarly, he has served on the Board of Directors at Knollwood Country Club since 1974. In 2015 he was a recipient of the Ike Grainger Award, given in recognition of his 25 years of service to the USGA. The following year, the WGA Caddie Scholarship Fund presented Bob with the 2016 the Udo Reinach Award for his demonstrable outstanding service and support of the Fund in the form of time, impact, and contributions. Recently, Bob presented a significant gift to the WGA Caddie Scholarship Fund enabling the establishment of the Bob J. Thomas endowed scholarship fund which will will be one of Bobâ&#x20AC;&#x2122;s permanent legacies for his tireless efforts to support the WGA, CSF, and the game over so many years. Bob currently serves as a consultant to the WGA Caddie Scholarship Fund and the Metropolitan Golf Association. He and his wife Beverly live in White Plains, New York. sustained success in such a competitive section for so long? A. Keeping everything very simple and basic in my golf swing. The more I have played, the better I’ve gotten and I understand the golf swing, I understand what works in my golf swing and what has worked for me over the years. I try not to change much and I always revert back to what has worked best for me. I spend a lot of time on my short game, chipping and putting. Then I would say I’ve trained my mind and my mental game to perform under whatever pressure there might come along with tournament golf. Q. With so many accomplishments already, what are your career goals from here, what are you looking to accomplish? year out. I would like to win the Professional National Championship, the MET Open again and some day be inducted into the Met Section Hall of Fame. I’m just trying to play the best golf possible and I know that if I can just keep putting in the time I need to into my game, then all the goals I’ve set for myself are possible. Q. You have had some big and exciting changes recently in your life. How are you handling your new Head Professional position at Fresh Meadow, as well as your new role as a father? happening. Setting up a new business, new golf shop from the beginning, but also making sure that my Members are taken care of, is an art and im just hoping im doing all the right things. I’m overseeing the renovation of our Learning Center, making sure that it will be state of the art and offer a top notch experience to our membership. And then being a father, I love it. It’s the best thing in the world.Nonstop with a new baby and amazed at how each day she grows and changes. Scheduling and making sure mom and I are on the same page has been tricky with the new job, but we will manage. Q. First foray into the senior ranks, how was your experience? A. My first year as a senior was a lot of fun. Most would think that the strength of the fields are weaker because the players are older, but thats not really the case. Itâ&#x20AC;&#x2122;s certainly not as deep, but there are so many really good senior players in the Met PGA and Nationally. 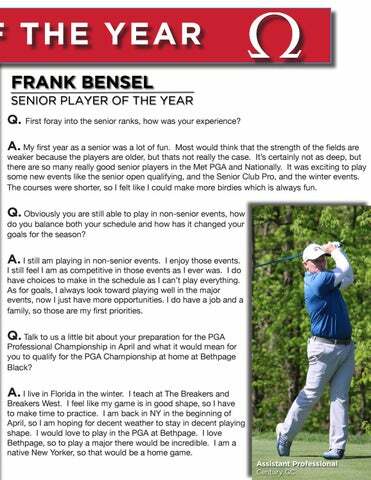 It was exciting to play some new events like the senior open qualifying, and the Senior Club Pro, and the winter events. The courses were shorter, so I felt like I could make more birdies which is always fun. Q. Obviously you are still able to play in non-senior events, how do you balance both your schedule and how has it changed your goals for the season? A. I still am playing in non-senior events. I enjoy those events. I still feel I am as competitive in those events as I ever was. I do have choices to make in the schedule as I canâ&#x20AC;&#x2122;t play everything. As for goals, I always look toward playing well in the major events, now I just have more opportunities. I do have a job and a family, so those are my first priorities. 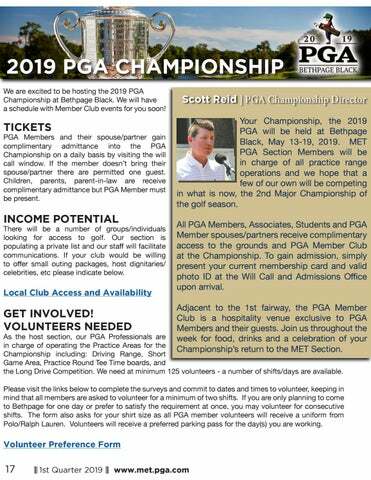 Professional Championship in April and what it would mean for you to qualify for the PGA Championship at home at Bethpage Black? A. I live in Florida in the winter. Q. It was your first time qualifying in the Assistants PGA Professional Championship, how was your experience? meet other Assistant Professionals from around the country. Luckily, the event was local enough for my family to attend and it gave me a little extra to play for seeing them walking alongside during the tournament. something you are gunning for? Secondly what would it mean to you to not only play on the inaugural team, but to represent the United States? It would be a dream come true to represent the United States and I have been striving to become a member of the inaugral team. Whaley taking over as the President of the PGA of America. What are your thoughts and hopes for future female PGA Professionals. A. It is certainly exciting for Suzy Whaley to be the PGA President. Suzy is a very qualified and passionate PGA Professional. It is commendable to witness her competing in tournaments and living out her message to the membership about the importance of playing golf. Suzy is a wonderful example for all professionals. Q. We have run the assistants tour for so long, how does that help prepare you for major championships and help your game? talent is just as good as the majors. The biggest difference is that it is an 18 hole shootout, rather than a 3-4 day tournament. On this tour, your strategy changes a bit because you don’t have other days to catch the leaders, which means you need to play a bit more aggressive at times and try to make as many birdies as you can. Q. Talk to us about your third-place finish in the PGA Assistant Professional Championship. Ultimately I’m sure you were a bit disappointed to not win, but you do get an exemption into next years assistants professional championship. Championship with three rounds in the 60’s. I’m pumped that I get an exemption into next years tournament because it is very hard to qualify for in the Met Section. Winning would have been huge for me because it would have meant a berth into the PGA Professional Championship, but third place against a national field on Assistants is pretty solid. yourself as an incredible player. Has this early success surprised you in any way? the Philly Section really opened up my eyes on how many great players there are in the PGA. My early success is a bit surprising, however, I wanted to continue to challenge myself by coming to the Met Section and competing against the best! 2019 PGA CHAMPIONSHIP We are excited to be hosting the 2019 PGA Championship at Bethpage Black. We will have a schedule with Member Club events for you soon! PGA Members and their spouse/partner gain complimentary admittance into the PGA Championship on a daily basis by visiting the will call window. If the member doesnâ&#x20AC;&#x2122;t bring their spouse/partner there are permitted one guest. Children, parents, parent-in-law are receive complimentary admittance but PGA Member must be present. There will be a number of groups/individuals looking for access to golf. Our section is populating a private list and our staff will facilitate communications. If your club would be willing to offer small outing packages, host dignitaries/ celebrities, etc please indicate below. Scott Reid | PGA Championship Director Your Championship, the 2019 PGA will be held at Bethpage Black, May 13-19, 2019. MET PGA Section Members will be in charge of all practice range operations and we hope that a few of our own will be competing in what is now, the 2nd Major Championship of the golf season. All PGA Members, Associates, Students and PGA Member spouses/partners receive complimentary access to the grounds and PGA Member Club at the Championship. To gain admission, simply present your current membership card and valid photo ID at the Will Call and Admissions Office upon arrival. Adjacent to the 1st fairway, the PGA Member Club is a hospitality venue exclusive to PGA Members and their guests. Join us throughout the week for food, drinks and a celebration of your Championshipâ&#x20AC;&#x2122;s return to the MET Section. As the host section, our PGA Professionals are in charge of operating the Practice Areas for the Championship including: Driving Range, Short Game Area, Practice Round Tee Time boards, and the Long Drive Competition. We need at minimum 125 volunteers - a number of shifts/days are available. Please visit the links below to complete the surveys and commit to dates and times to volunteer, keeping in mind that all members are asked to volunteer for a minimum of two shifts. If you are only planning to come to Bethpage for one day or prefer to satisfy the requirement at once, you may volunteer for consecutive shifts. The form also asks for your shirt size as all PGA member volunteers will receive a uniform from Polo/Ralph Lauren. Volunteers will receive a preferred parking pass for the day(s) you are working. EXTERIOR The PGA Member Club will be located on the 1st Hole adjacent to the Wanamaker Club and will offer a first-class Member experience with free snacks, discounted food, and drinks. The club will pay homage to the storied history of our section and PGA Professionals. The Club is heated/airconditioned and will also host several special events throughout Championship week. 2019 SCHEDULE LOOKING DIFFERENT Because of the schedule change of the PGA Championship and the PGA Professional Championship, our Metropolitan PGA Tournament Schedule looks significantly different than it has customarily laid out. While the movement of the PGA Professional Championship to late April has received much less notoriety than that of the PGA Championship to mid-May, the impact is very significant. 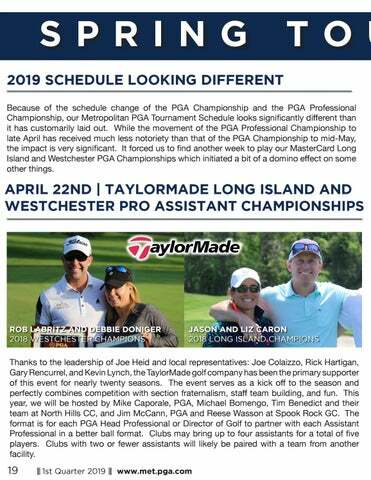 It forced us to find another week to play our MasterCard Long Island and Westchester PGA Championships which initiated a bit of a domino effect on some other things. Thanks to the leadership of Joe Heid and local representatives: Joe Colaizzo, Rick Hartigan, Gary Rencurrel, and Kevin Lynch, the TaylorMade golf company has been the primary supporter of this event for nearly twenty seasons. The event serves as a kick off to the season and perfectly combines competition with section fraternalism, staff team building, and fun. This year, we will be hosted by Mike Caporale, PGA, Michael Bomengo, Tim Benedict and their team at North Hills CC, and Jim McCann, PGA and Reese Wasson at Spook Rock GC. The format is for each PGA Head Professional or Director of Golf to partner with each Assistant Professional in a better ball format. Clubs may bring up to four assistants for a total of five players. Clubs with two or fewer assistants will likely be paired with a team from another facility. 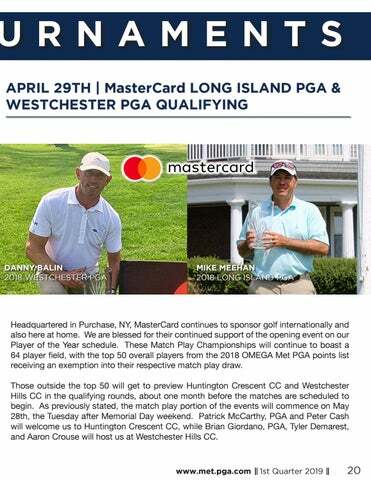 Headquartered in Purchase, NY, MasterCard continues to sponsor golf internationally and also here at home. We are blessed for their continued support of the opening event on our Player of the Year schedule. These Match Play Championships will continue to boast a 64 player field, with the top 50 overall players from the 2018 OMEGA Met PGA points list receiving an exemption into their respective match play draw. Those outside the top 50 will get to preview Huntington Crescent CC and Westchester Hills CC in the qualifying rounds, about one month before the matches are scheduled to begin. As previously stated, the match play portion of the events will commence on May 28th, the Tuesday after Memorial Day weekend. 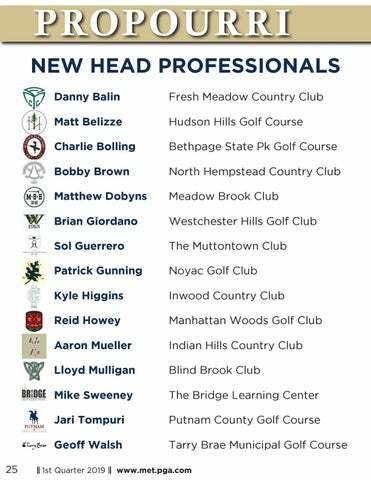 Patrick McCarthy, PGA and Peter Cash will welcome us to Huntington Crescent CC, while Brian Giordano, PGA, Tyler Demarest, and Aaron Crouse will host us at Westchester Hills CC. With the Match Play Championships moving into Memorial Day week, the POLO Golf Met PGA Head Pro Championship needed a place to land and we are excited to announce May 6TH-7TH as the dates for 2019. Polo/Ralph Lauren is another tournament sponsor with great tenure. The POLO Golf Head Professional Championship will be hosted by Burning Tree CC on May 6TH-7TH, 2019. Head Professional Todd Wingerter, General Manager Charles Torrance and Superintendent Steve Wickstrom are excited to welcome such a prestigious local championship. The Head Pro Championship will again feature a tiered purse, with a significant bonus for those head professionals who: have an active account with Ralph Lauren, have made or commit to a tournament order for 2019, or have scheduled a meeting with their sales rep for 2019. The 36-hole championship includes both a Regular and Senior Division and allows eligible players to enter both if they choose. There is also an 18-hole Life Member division played on Monday, May 6th only. One of the great changes to our 2019 schedule was rebranding the event formerly known as the Met PGA Women’s Stroke Play to the Met PGA Women’s Championship. This change more consistently aligns our subset member championships (Assistant, Women, Senior) and elevates the image of the event to what it should be. We then decided that combining the Met PGA Women’s Championship with our Head Professional Championship would provide a more significant tournament feel and an opportunity to celebrate our champions among a larger group of PGA professionals together at Burning Tree CC. While our Women’s Met Open is often viewed as the primer event in the area, our Women’s Section Championship is the top competition for our PGA members and continues to enjoy the support of Michael Hebron. Players who are also eligible for Head Pro Championship may enter both if they choose. LINCOLN MET PGA PRO AM SERIES For many years “Lincoln” and “Pro Am” have rolled off the tongues of golfers in our area as though they were one word. This identity is fantastic, but we need to further advocate for loyalty to Lincoln. The most important aspect of Lincoln’s sponsorship is the ability to retain current customers and attract new ones through its relationship with golf. Any PGA professional, club member, family, or friend purchasing or leasing a Lincoln or Ford product MUST register with us first so we can offer them the relationship incentive and account for them as a sale attributable to the golf sponsorship. In addition, we must continue to support the Pro Am Series events. 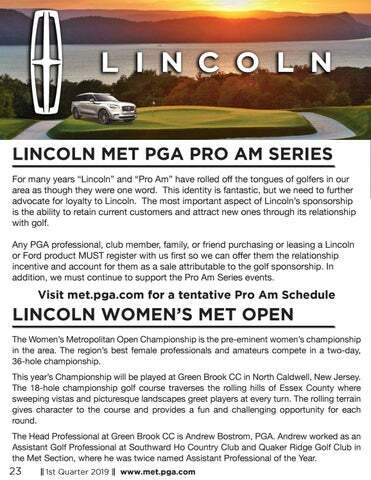 LINCOLN WOMEN’S MET OPEN The Women’s Metropolitan Open Championship is the pre-eminent women’s championship in the area. The region’s best female professionals and amateurs compete in a two-day, 36-hole championship. This year’s Championship will be played at Green Brook CC in North Caldwell, New Jersey. The 18-hole championship golf course traverses the rolling hills of Essex County where sweeping vistas and picturesque landscapes greet players at every turn. The rolling terrain gives character to the course and provides a fun and challenging opportunity for each round. 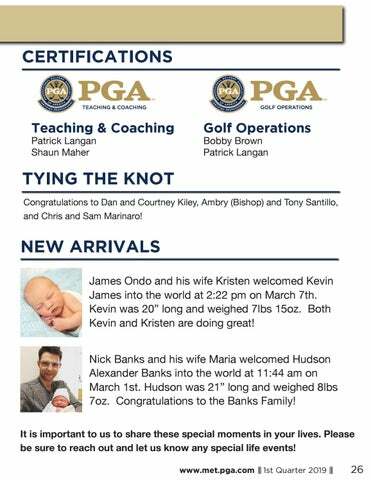 The Head Professional at Green Brook CC is Andrew Bostrom, PGA. Andrew worked as an Assistant Golf Professional at Southward Ho Country Club and Quaker Ridge Golf Club in the Met Section, where he was twice named Assistant Professional of the Year. 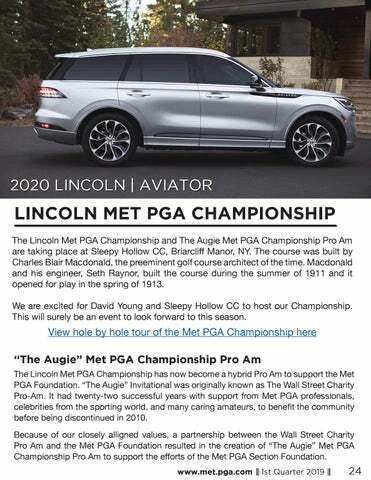 LINCOLN MET PGA CHAMPIONSHIP The Lincoln Met PGA Championship and The Augie Met PGA Championship Pro Am are taking place at Sleepy Hollow CC, Briarcliff Manor, NY. The course was built by Charles Blair Macdonald, the preeminent golf course architect of the time. Macdonald and his engineer, Seth Raynor, built the course during the summer of 1911 and it opened for play in the spring of 1913. We are excited for David Young and Sleepy Hollow CC to host our Championship. This will surely be an event to look forward to this season. TYING THE KNOT Congratulations to Dan and Courtney Kiley, Ambry (Bishop) and Tony Santillo, and Chris and Sam Marinaro! 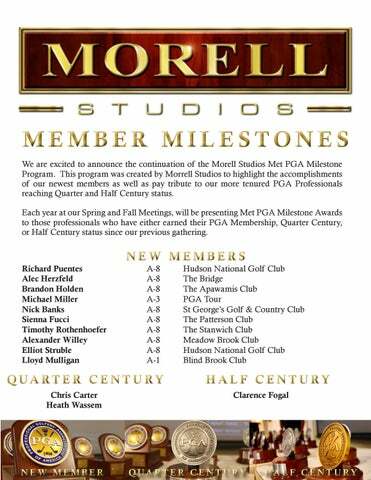 MEMBER MILESTONES We are excited to announce the continuation of the Morell Studios Met PGA Milestone Program. 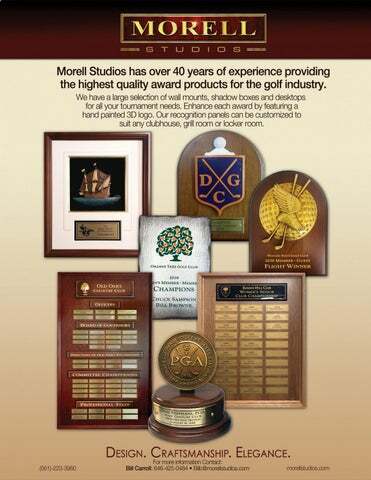 This program was created by Morrell Studios to highlight the accomplishments of our newest members as well as pay tribute to our more tenured PGA Professionals reaching Quarter and Half Century status. Each year at our Spring and Fall Meetings, will be presenting Met PGA Milestone Awards to those professionals who have either earned their PGA Membership, Quarter Century, or Half Century status since our previous gathering. offer an additional spot for showing your golf course or company logo, for free! Offer ends July 31st. Pricing includes a one color, one location imprint. $19.50 CUSTOM HANDLE MEDALLION The Guardian Umbrella features an epoxy dome handle medallion, which is inserted at the bottom of the slip-resistant rubber handle to showcase your club or company logo at no additional cost! FOUNDATIO Met PGA Foundation Update This is an exciting year for the Metropolitan Section as we get ready to play stage to the 2019 PGA Championship. With the Championship comes a huge opportunity for us to tell the story of our Section and growth of the Foundation. 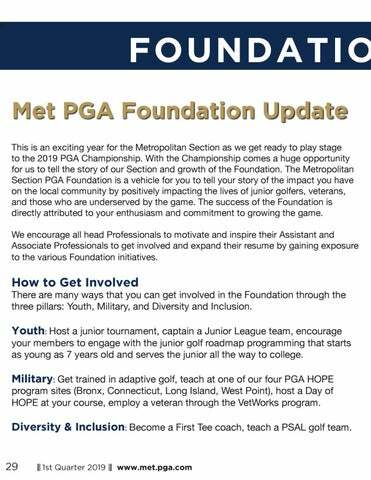 The Metropolitan Section PGA Foundation is a vehicle for you to tell your story of the impact you have on the local community by positively impacting the lives of junior golfers, veterans, and those who are underserved by the game. The success of the Foundation is directly attributed to your enthusiasm and commitment to growing the game. We encourage all head Professionals to motivate and inspire their Assistant and Associate Professionals to get involved and expand their resume by gaining exposure to the various Foundation initiatives. There are many ways that you can get involved in the Foundation through the three pillars: Youth, Military, and Diversity and Inclusion. your members to engage with the junior golf roadmap programming that starts as young as 7 years old and serves the junior all the way to college. Military: Get trained in adaptive golf, teach at one of our four PGA HOPE program sites (Bronx, Connecticut, Long Island, West Point), host a Day of HOPE at your course, employ a veteran through the VetWorks program. 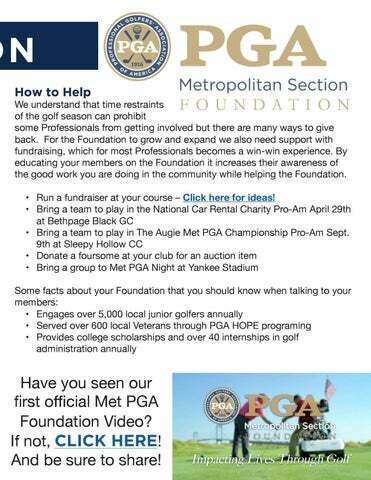 Have you seen our first official Met PGA Foundation Video? If not, CLICK HERE! And be sure to share! 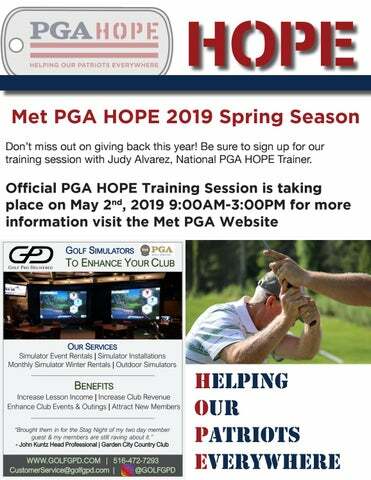 HOPE Met PGA HOPE 2019 Spring Season Don’t miss out on giving back this year! Be sure to sign up for our training session with Judy Alvarez, National PGA HOPE Trainer. 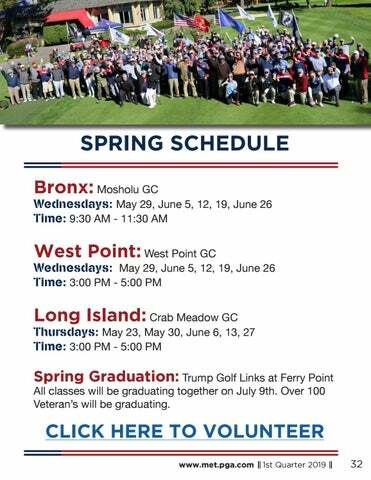 Spring Graduation: Trump Golf Links at Ferry Point All classes will be graduating together on July 9th. Over 100 Veteranâ&#x20AC;&#x2122;s will be graduating. 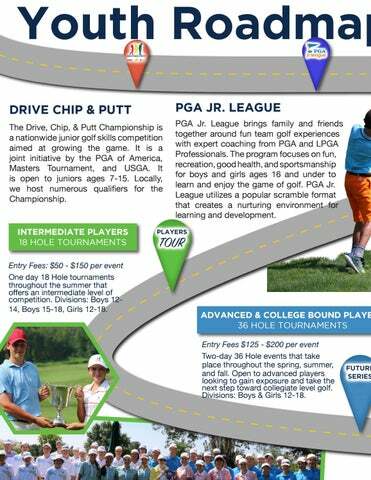 The Drive, Chip, & Putt Championship is a nationwide junior golf skills competition aimed at growing the game. 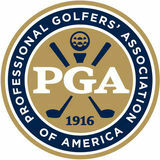 It is a joint initiative by the PGA of America, Masters Tournament, and USGA. It is open to juniors ages 7-15. Locally, we host numerous qualifiers for the Championship. PGA Jr. League brings family and friends together around fun team golf experiences with expert coaching from PGA and LPGA Professionals. The program focuses on fun, recreation, good health, and sportsmanship for boys and girls ages 16 and under to learn and enjoy the game of golf. 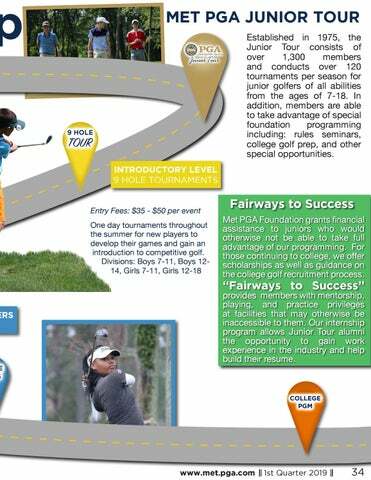 PGA Jr. League utilizes a popular scramble format that creates a nurturing environment for learning and development. INTERMEDIATE PLAYERS 18 HOLE TOURNAMENTS Entry Fees: $50 - $150 per event One day 18 Hole tournaments throughout the summer that offers an intermediate level of competition. Divisions: Boys 1214, Boys 15-18, Girls 12-18. ADVANCED & COLLEGE BOUND PLAYE 36 HOLE TOURNAMENTS Entry Fees $125 - $200 per event Two-day 36 Hole events that take place throughout the spring, summer, and fall. Open to advanced players looking to gain exposure and take the next step toward collegiate level golf. Divisions: Boys & Girls 12-18. Fairways to Success Met PGA Foundation grants financial assistance to juniors who would otherwise not be able to take full advantage of our programming. For those continuing to college, we offer scholarships as well as guidance on the college golf recruitment process. provides members with mentorship, playing, and practice privileges at facilities that may otherwise be inaccessible to them. Our internship program allows Junior Tour alumni the opportunity to gain work experience in the industry and help build their resume. Q. Who is your golf teacher? Kevin Smith, PGA Professional at Montauk Downs, New York. Q. If you could choose to play golf with a dream foursome, who would the other three people be? Tiger, Jordan and Ricky. Q. What food would you serve at your Champions Dinner at Augusta National? Mac and cheese. Q. What part of golf do you like to practice the most? Trick shots around the green. Q. If you could choose to play golf with a dream foursome, who would the other three people be? My brother Leo, sister Amelie and coach Bob Bigonette, PGA. Q. What food would you serve at your Champions Dinner at Augusta National? For an appetizer, calamari and oysters. For dinner, lobster and corn on the cob. Q. Who do you normally play golf with? My brother Chris. golf? If so, please describe: I always have my lucky Augusta ball marker and my divot repair tool. Q. What food would you serve at your Champions Dinner at Augusta National? Cornbeef, mac & cheese bites, wings from Buffalo Wild Wings, Mug Cream Soda and Nonnaâ&#x20AC;&#x2122;s cookies (grandmother of best friend). Q. What do you like most about playing golf? What I like about golf is its flexibility. You can play golf for fun, but it can also be played competitively. It also can be played by all ages, young and old. Q. What is your biggest achievement in golf? Qualifying for the Drive, Chip and Putt. Q. What food would you serve at your Champions Dinner at Augusta National? Probably steak, pasta and chocolate fondue.